You are at:Home»Featured Games News»Marvel: Strike Force»Check your roster – Carnage is finally here! 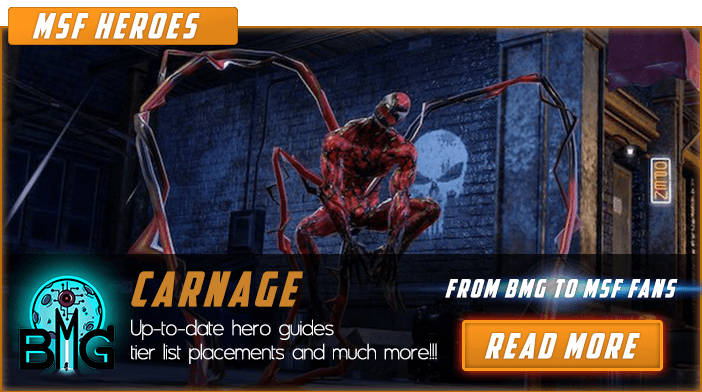 Check your roster – Carnage is finally here! A month has passed since we received information that Carnage will be added in Marvel Strike Force roster and I think that we waited long enough! My expectations were great but luckily everything was paid off in the end – Carnage is definitely a good Hero. Cletus Kasady aka Carnage was a serial killer before merging with Venom and becoming his offspring. Allien symbiote responsible for Venom and Carnage transformation had a much greater connection with Carnage than with Venom making Carnage more violent, aggressive and deadly. After escaping prison Carnage began a series of murders leaving blood-written Carnage trail behind him. Spider-Man tried to stop him but Carnage was too strong and Spider-Man had to make peace with Venom and ask him for help. Eventually, they defeated Carnage with sonic weaponry and placed him in The Vault, prison for Super-Villains. In Marvel Strike Force, Carnage is a powerful brawler capable to inflict an enormous amount of damage, spread negative effects and apply Bleed. Additionally, his Speed Bar is filled and his HP is restored every time enemy Health is below 25%. As expected, Carnage will work best with the rest of Spider-Verse heroes but his skills can be successfully used with other Heroes as well. At first glance, he is definitely a Hero who belongs in the second Tier of Heroes but he could easily be in the best tier if Spider-Verse team succeed in fighting with other meta teams (TECH, Defender, Shield…), however, that remains to be seen in the days to come. BlueMoonGame placed Carnage in all our TierLists and Builders and you can see full info about him in our MSF Hero page. We hope that releasing of Carnage is an introduction to much expected Alliance Wars and that we will not wait long before our next post regarding Marvel Strike Force. ← Marvel Strike Force Developer Update 9 ← Behold the power of Ronan and the Kree!